"Illyana spent her childhood fighting to survive in Limbo. With her teleportation powers, magical abilities, and the Soulsword, she eventually defeated the evil sorcerer who controlled this dimension and became its ruler. She's since returned to Earth, where she puts her powers to use on a team of rookie X-Men as Magik." Check out the brand new 4-Star Magik, and find out how you can recruit her onto your roster! Summoning a stepping disc, Magik teleports herself to the Limbo dimension to gain power. Create a 2-turn Purple Repeater tile that converts 2 basic tiles to Red. While this tile is on the board, this power becomes The Return. Magik returns from Limbo and surprises her opponent with an attack. When Magik's Repeater tile is matched away or destroyed, create 2 strength 52 Purple Strike tiles. When Magik's Repeater tile is no longer on the board, this power becomes Ruler of Limbo. Level 2: ...create 2 strength 72 Purple Strike tiles. Level 4: ...create 3 strength 76 Purple Strike tiles. Level 5: ...create 3 strength 126 Purple Strike tiles. Using her Soulsword, Magik slices through her opponents to disrupt their magic. Deal 1777 damage and remove up to 1 enemy Strike, Attack, Protect, or Countdown tile. Level 3: ...remove up to 2 enemy Strike, Attack, Protect, or Countdown tiles. Each use of Magik's powers causes more pieces of a mystical armor to appear on her. Whenever a friendly power is fired, create 1 strength 72 Protect tiles and fortify 1 friendly Strike, Protect, or Attack tiles and improve it by 54. Level 2: ...improve it by 97. Level 5: ...create 2 strength 135 Protect tiles...improve them by 128. 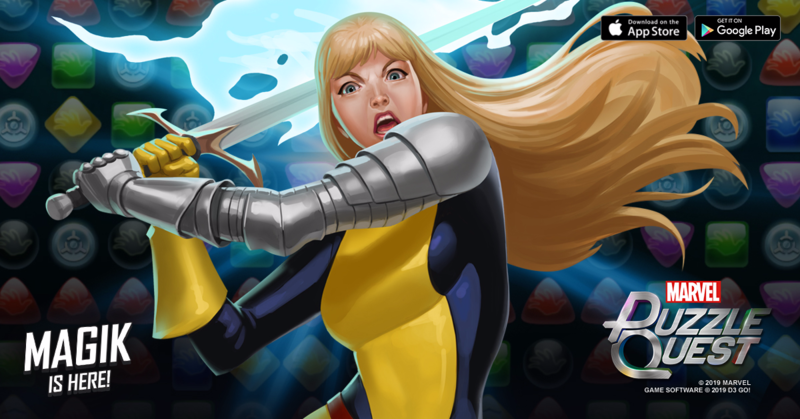 What do you think is Magik's best build? Vote down below! Rewards tokens to Strange Sights, random cover of Magik, and more! Now this is how you make a character with repeater tile mechanic work. Looking at you Emma Frost. On a side note, now that we have all Phoenix 5 characters in game can we have some alt costumes plox? Really glad I got that 10th Bishop cover in Shield Sim last night. As for Magik, it appears 3/5/5 is the way to go to take advantage of the Red Nuke and the Blue Passive. She won't move the meta but at least she's not DOA like Submariner was. One thing I do wonder about. If she's matched against Kitty and Kitty's passive destroys her Purple passive (and there are no other special tiles on the board) do her strike tiles get created before Kitty's damage kicks in or after. Ideally they come first to deny Kittys damage. Seems like a decent partner for Bl4de. If you can hold off on casting Red until the last enemy. Kitty's passive doesn't target repeater tiles. It only replaces attack, strike, protect, or countdown tiles. So once Magik's repeater is destroyed or matched away and the strike tiles are produced, then Kitty's passive will trigger. A few times ago it was C4rol and Medusa. I needed both, but both were the wrong colors. Now all I need is GRocket Yellow and HoboFist Black. So what do they offer? ... Blue and Blue... COME ON!! Thematically Strange Sights feels like a great launch event for her, but wasn't it just run a couple weeks ago? Yeah, but I'm never going to be complaining about Strange Sights running more often. So the characters required for SHIELD Training is Grocket, Hobofist and...Bishop? In the grand scheme of things, probably unnecessary for me to mark those changes, but I actually highlighted those smaller details manually. I didn't use any Track Changes feature or anything. You guys are really pushing it with Bishop as the third character in Shield Training. Why don’t you just make Majik and Namor required too? I was thinking the same thing and so were others in my alliance. Really ought to include the required characters under Shield Training in the event schedule. We can always figure it out because it's always the characters listed under the vault, but people always ask because it's never clearly stated. So why not just post it clearly to avoid confusion and questions in the first place? She looks like Kitty's little sister (but don't call her tinykitty).....and kinda works like Kitty too. Anyway, I like this one. 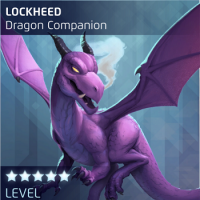 If she was 5*, she would actually pair well with Kitty, being X-men, creating specials, fortifying specials, buffing specials and having a useful nuke. 9 Purple: Create 1-turn purple repeater, which adds 2 red tiles. If repeater is matched/destroyed, create 2 purple strike tiles. This power reminds me of Clagger, who either adds black tiles or makes attack tiles (which is Clagger's best power because it's passive). But this costs 9 AP, so it's like you're trading purple AP for Red AP. If you play this with the intent to match it away, then it's no better than 3* Punisher's green to add some strike tiles. The repeater or strike tiles have a better chance of surviving since they are on the same color which activates the power. This could work very well with 4*Blade....at first, you avoid Red and match purple, then you place the repeater to keep making red for Blade to either produce beefy strikes or start randomly hitting people. But it's an expensive battery at 9 AP, but still useable. The strikes you get when it's matched away are not useless because she can fortify and buff them. 12 Red : A solid nuke with added defense of removing specials. Simple and effective. Since her purple repeater can fuel this power, we could pretend that it doesn't cost so much, but we would be fooling ourselves. Collecting 12 Red is easier than collecting 9 Purple THEN 12 Red. Nevertheless, I don't fault this power set. If she was paired with Blade, this could be a good backup plan to stop something, including Carol's Black CD tile of death or Grockets green auto-bomb. Blue Passive: This power is definitely her best one and could easily be exploited. Passive protect tile creation, fortification and buffing for just firing ANY power, including her own. So, you could add this power's text to her 2 active powers above.....9 Purple AP create 1-turn repeater and 2 fortified protect tiles of strength 264.......or 12 Red AP deal 9,448, remove 2 enemy specials and create 2 fortified protects. Imagine using this passive with Wasp's 5 yellow AP.......create 1 strike and 3 protects (2 fortified).....fire again to flip protect/strikes, buff them, create 2 more protects, fortify 2 and buff 2 again! That's some sweet efficiency. Add in Prof-X or Shuri or 4*Panther for even more awesome synergy. You could also pair with Nova for cheap spamming powers to create a ton of strikes and protects. With 5* characters, you could pair her with Kitty and OML for some awesome passive special tile creation and buffing. She would be the "weak link" but it would work. 3/5/5/ for me. I love her repeater that converts 2 basic tiles to red tiles. First few partners that I can think of to take advantage of her repeater tile: 4* Blade, 3* Cyclops, 3* Daredevil. Her blue passive reminds me of Prof X's power without the fortification. Some other obvious partners of hers are those that revolves fortication of tiles like Shuri, Black Panther etc. She looks like a pretty good character. Got Bishop on 9. Still time to get the 10th, so BH'd him immediately. On a side note, Bishop is a terrible nuisance to play against as i noticed in the Support Circuit today.